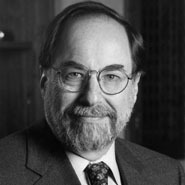 Biologist David Baltimore was a young professor at the Massachusetts Institute of Technology when he shared a 1975 Nobel Prize in Physiology or Medicine for his discovery of reverse transcriptase, an enzyme that plays a vital role in the reproduction of retroviruses, including those that cause AIDS and some cancers. Baltimore's work, which showed how some viruses reproduce themselves, ran counter to conventional scientific wisdom of the day. A former president of Rockefeller University, Baltimore also created the Whitehead Institute for Biomedical Research at MIT.